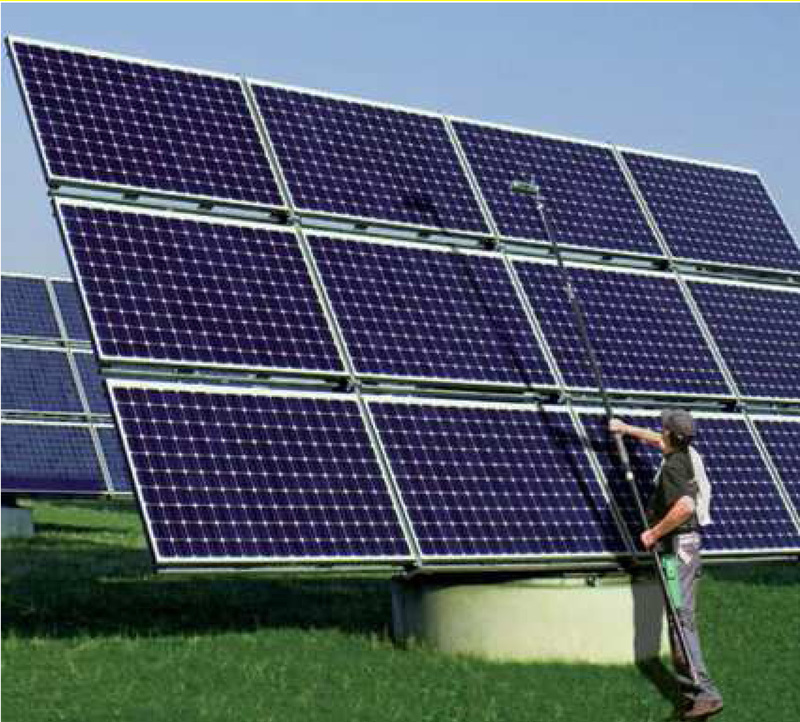 The cleaning of photovoltaic panels is becoming an increasingly incredible business for all those cleaning Companies that are specifically equipped for the job. In order not to lose the chance of fully benefiting from this new market sector, Cleaning Management has developed in collaboration with Unger, one amongst the best producing cleaning Companies in the world, some innovative systems for the removal of all dirt remains from solar panels and the increasingly common photovoltaic panels. 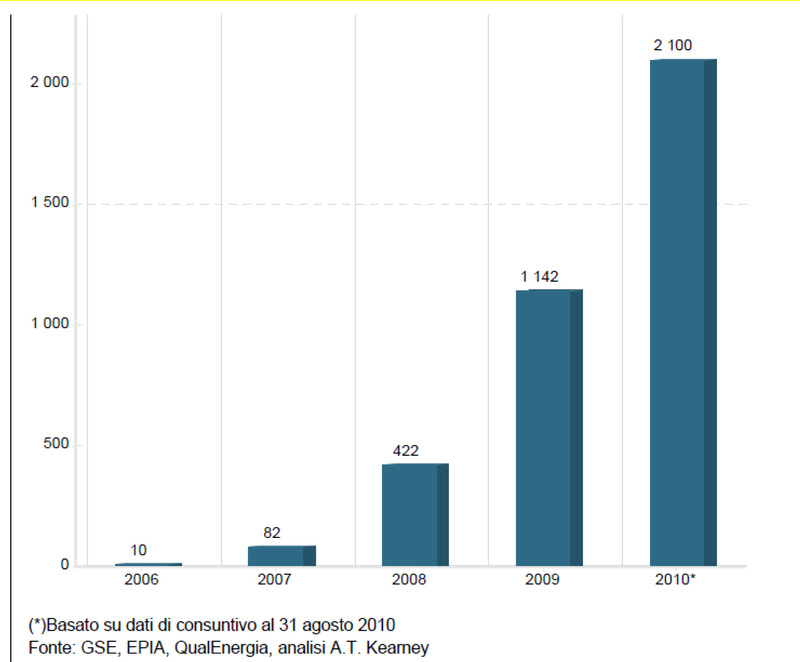 In order to better understand the development of photovoltaic use in Italy and all the cleaning potential it represents for a fully prepared Company, we hereby show a table indicating the increase of number of installations from 2006 and 2010 of (in thousands). If we consider the fact that a 1.100 sq.mt. photovoltaic plant such as the one installed on the Cleaning Management rooftop and producing 64 KWh allows, in a balance between consume and spare energy being sold and reintroduced into the network, net savings of about €.7.400 per year, we also take into account the fact that if such plant is not correctly cleaned for 4 times a year with a total investment of €.1.600 (€.400 per exit), it may yield between 30% and 50% less that the theoretic amount of energy guaranteed by the installer. This is the very basis for a commercial proposal that a cleaning Company may offer Cleaning Management. Theoretic electric energy saving guaranteed by the installing Company while fixing the photovoltaic panels: about €. 7.400 per year. In the light of these considerations, it is easy to understand the importance of the cleaning services carried out by the specifically specialized Company of which Cleaning Management is a client because, after the payment of a € 1.600 invoice, they allow savings of €. 620 \ €. 2.100 year. There are no precise data available as to the amount of money that a Company may request for the cleaning of photovoltaic panels, but there is a simple chart showing the money savings deriving from the job and consequently linked to a related work cost estimate. Please find attached the file, together with a presentation of the method and systems proposed by Cleaning Management for the cleaning of photovoltaic panels, at full disposal of all the registered users of our website.